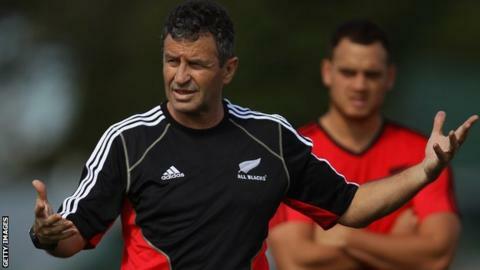 Former New Zealand head coach Wayne Smith has been appointed All Blacks defensive coach for 2015. Waikato Chiefs assistant coach Smith, 57, was in charge of the All Blacks from 2000 to 2001, and was assistant coach from 2004 until 2011, when they won the World Cup on home soil. "He is one of the most astute rugby coaches in world rugby," said head coach Steve Hansen. The 2015 World Cup in England and Wales starts in September. Smith, who will leave the Chiefs, said: "I care deeply about the All Blacks, I'm excited to be back and looking forward to getting stuck into next year." Hansen added: "Smithy will add another dimension to what is already a strong coaching group in what will be a big year for us. "His role will be purely around defence, but we will tap into his vast knowledge of other areas of the game." Smith, who played 17 Tests for the All Blacks between 1980 and 1985, spoke with England head coach Stuart Lancaster in 2012 about taking charge of England's backs, before joining the Chiefs. New Zealand start their World Cup campaign against Argentina in Pool C on 20 September at Wembley.